Custom Layout Insights - Breaking News: The Wait is Over! Well, visually-assisted automation is the collective term we use for a set of productivity aids that leverage the graphical use model familiar to layout designers while eliminating the need to write complicated code and constraints. The job of the Assistants is to deal with routine and repetitive tasks automatically without extra setup. Custom Compiler provides four types of assistants: Layout, In-Design, Template and Co-Design. For now, here’s a quick outline of each Assistant. I will talk about each of them in more detail in future blog posts. Layout Assistants speed layout with visually-guided automation of custom device placement and routing. The router is ideal for connecting FinFET arrays or large-M factor transistors. It automatically clones connections and creates pin taps. The user simply guides the router with the mouse and it fills in the details automatically. The placer uses a new innovative approach to device placement. It allows the user to make successive refinements, offering placement choices but leaving the layout designer in full control of the results—without requiring any up-front textual constraint entry. In-Design Assistants reduce costly design iterations by catching physical and electrical errors before signoff verification. Custom Compiler includes a built-in design rule checking (DRC) engine, which is extremely fast and can be active all the time. In addition to the DRC engine, electromigration checking, and resistance and capacitance extraction are all natively implemented in Custom Compiler. Unlike other “electrically-aware” tools, Custom Compiler’s extraction is based on Synopsys’ gold-standard StarRC engine. Template Assistants help designers reuse existing know-how by making it easy to apply previous layout decisions to new designs. Template Assistants actually learn from the work done with the Layout Assistant’s custom device placer and router. They intelligently recognize circuits that are similar to ones that were already completed and enable users to apply the same placement and routing pattern as a template to the new circuits. Custom Compiler comes pre-loaded with a set of built-in templates for commonly-used circuits, such as current mirrors, level shifters, and differential pairs. 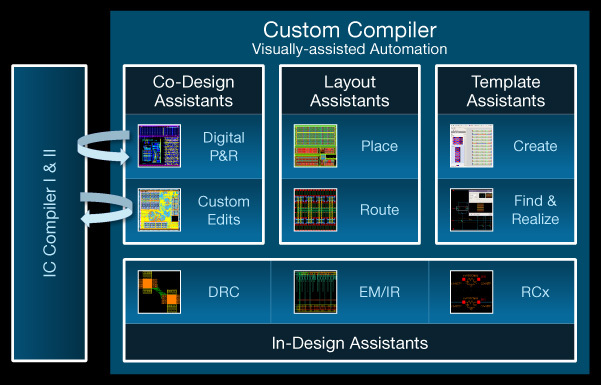 Co-Design Assistants combine IC Compiler and Custom Compiler into a unified solution for custom and digital implementation. Users can freely move back and forth between Custom Compiler and IC Compiler, using the commands of each to successively refine their designs. With the Co-Design Assistants, IC Compiler users can perform full-custom edits to their digital designs at any stage of implementation. Likewise, Custom Compiler users can use IC Compiler to implement digital blocks in their custom designs. The lossless, multi-roundtrip capability of the Co-Design Assistants ensures that all changes are synchronized across both the digital and custom databases. This is really exciting stuff and Synopsys users can see it in action at the Silicon Valley SNUG. For more information, visit www.customcompiler.info. Oh, and don’t forget to check back here for more details on Custom Compiler! This entry was posted on Wednesday, March 30th, 2016 at 6:46 am. You can follow any responses to this entry through the RSS 2.0 feed. You can leave a response, or trackback from your own site.